The DNA Test results have been obtained and have identified the driver involved in the Polk County fatal crash that occurred on 12/4/14. The driver involved in the crash has been identified as Shamel Donnel Baldwin, 22, of Camden. This crash remains under investigation. A 1989 Ford Taurus sits burned out off Lyons Cemetery road on Thursday morning (12/04/14). Body Found in Burned Out Vehicle, MOSCOW, December 5, 2014 - Shortly after 10 am December 4, 2014, a passing motorist spotted a vehicle that was burned off Lyons Cemetery Road (off FM-62) and called the Polk County Sheriff's Office. Trooper Zach Lenderman with the Texas Highway Patrol was dispatched to the scene. Upon arrival, Lenderman observed that the vehicle (a 1989 Ford Taurus) had apparently struck a large pine tree, caught fire and burned with the driver (a male) still inside. Local Texas Ranger, Ryan Clenneden was summoned to also investigate. The accident is believed to have occurred sometime after 5 am that same morning. The deceased driver was sent to Jefferson County Morgue in Beaumont positive identification and to determine the cause of death. The vehicle was recovered by Riley Wrecker Service out of Corrigan. At time of press, that's all the information we have as the incident remains under investigation by the Texas Department of Public Safety. 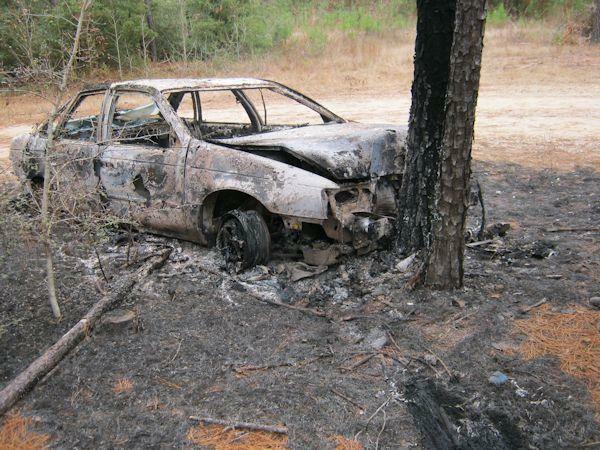 In October of 2010, a burned out car was found with a body which eventually led to a murder conviction.